On 19th July 1838 the Court of Common Council of the City of London agreed to a contribution of £500 toward the cost of the above statue of the Duke of Wellington in appreciation of his efforts in assisting the passage of the London Bridge Approaches Act 1827. This Act led to the creation of King William Street. The government donated the metal, which is bronze from captured enemy cannon melted down after the Battle of Waterloo, and valued at the time at £1500. The total cost of the statue was £9000. The remainder being raised by public subscription. 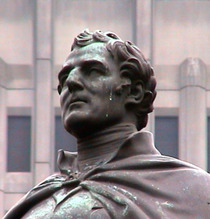 The sculptor, Sir Francis Chantrey (1781 to 1841), was commissioned in 1838 but died before the work was completed. It was finished by his assistant Henry Weekes (1807 to 1877). 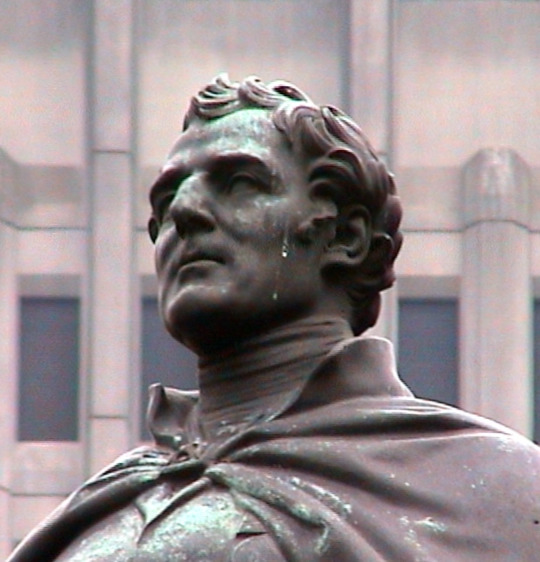 The Lord Mayor, William Magnay, unveiled the statue on 18th June 1844, the anniversary of Waterloo, in the presence of his guest the King of Saxony. Adjoining the statue, a piece of granite from London Bridge (1825 to 1967) has been set into the pavement by the Corporation of London. The elevational stonework from the same bridge was re-erected over the Colorado River in Lake Havasu City, Arizona, USA, in 1971. Granite from London Bridge, 1825 - 1967, commemorating the assistance given by the Duke of Wellington to the passage of the London Bridge Approaches Act 1827. The lamp standards on the perimeter of this forecourt were presented to the citizens of London by the twelve great livery companies, 1985. Unveiled in Wellington's presence, this is one of only a handful of statues in London unveiled while the subject was still alive. The others are listed at Fenner Brockway. The entrance to the underground here holds the first underground toilets, opened in 1854.